(no tour on: 25 Dec, 01 Jan). Tour Ends: Near Wenceslas Square. An afternoon trip from Prague to tour the historic Velke Popovice Brewery, where Kozel beer is brewed. Includes a tasting of the premium beers produced here. After picking you up from your Prague hotel, we drive for around 25 minutes to reach Velke Popovice. Beer has been brewed here since the 14th century, but the most significant date is 1874, when the Prague industrialist Baron Ringhoffer transformed the old buildings into a new state-of-the-art brewery to produce Kozel. In 1842 Czech brewers had produced the world's first golden lager, achieved through a new fermentation technique, and by storing the beer in cold cellars cut into rock. It was this process that Baron Ringhoffer employed to create his Kozel. Our tour of the Kozel brewery leads us through the history of brewing from those early years to the present day. We learn about the brewing techniques, the ingredients used, and visit the old lager cellars. Forward to today, and we observe how science and technology has transformed the process. We tour the modern Kozel brewing plant, bottling and barrelling rooms, and learn about beer labelling, loading, shipping and exporting. Today, Kozel produce a variety of light and dark beers. All are covered on the tour. Naturally we finish with a good beer tasting, of freshly brewed, unpasteurised, unfiltered Kozel. Before we leave, there is time to browse the onsite shop which stocks Kozel beer, as well as glasses, jugs, beer towels, T-shirts and more. Refreshments are also available in the shop. The trip finishes back in Prague, near Wenceslas Square. 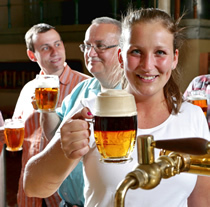 Hotel pick up + Guided tour & admission to Kozel Brewery + Beer tasting.